What Kind of [Censored] Runs Around in a Christmas Sweater? Michael Myers: Boiler suit. Jason Voorhees: Overalls, maybe a nice button-down shirt and some jeans. Leatherface: Suit and tie, apron optional. Clothes make the killer, so what the hell is up with Freddy Krueger’s favorite outfit? Michael and Jason probably don’t care what they are wearing, they aren’t really human enough to worry about it. Leatherface dresses to fit a role in his twisted family. Freddy can look and be anything but he really loves his fedora with red and green sweater combo most of all. Red and green alternating stripes is his calling card of sorts, he can’t help but include it in things when he is present, from the rooftop of a car (Nightmare on Elm St.(1984))to the color of the food he’s stuffing into the face of Greta (Erika Anderson) from Nightmare on Elm St. 5: The Dream Child (1989). Freddy’s creator Wes Craven has said that red and green was chosen because those colors are a strong contrast and create a visual uneasiness. It makes sense to me that since Freddy’s primary weapon is fear he’s employing psychological tactics right away by using this combination. 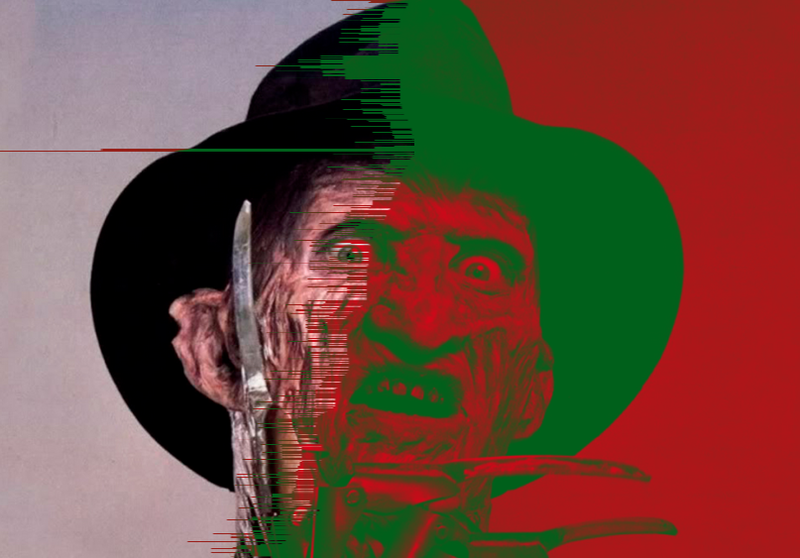 This useful bit of color theory could once again point to Freddy Krueger’s previous life as some kind of failed artist. In his career as a child killer, a sweater might also put some unsuspecting kids at ease. Mr. Rogers taught us that people in sweaters aren’t scary and couldn’t possibly want to hurt us, right? This could be the thought process of a maniac who then proceeds to pick out the most upsetting color combination possible. As for the fedora? Well, maybe he just really likes it, I mean he wrote his name in it and everything.